Last night I made a delicious frittata for dinner. 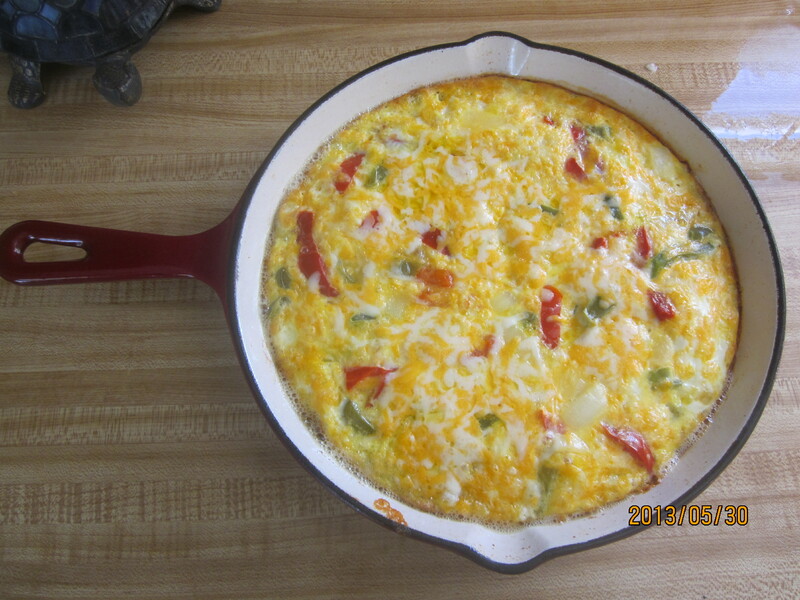 I like to cook a couple of vegetarian meals each week and frittatas are one of my favorite dishes. It is a great way to use up leftovers, they are quick and easy, and they make a tasty and light dinner. Here’s how you do it. First, preheat the oven to 325 degrees Fahrenheit. 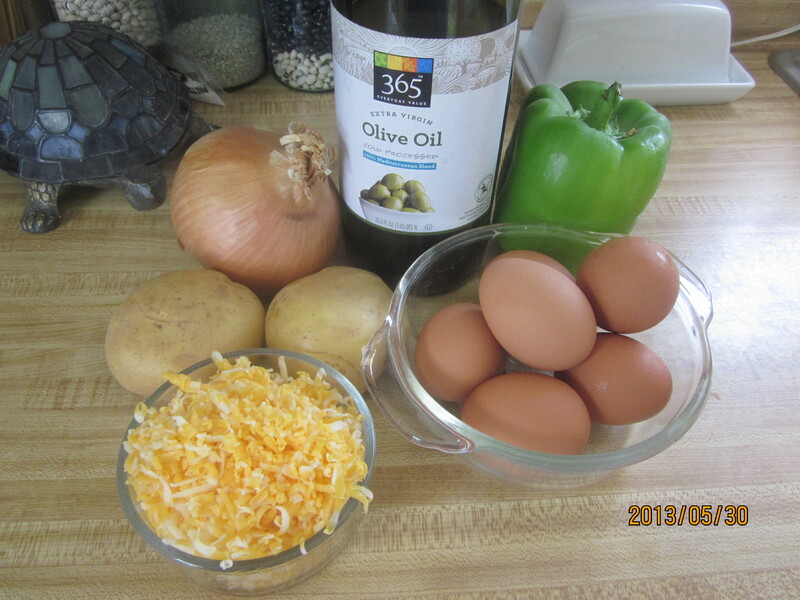 Next, beat the eggs together in a medium bowl and mix in veggies and cheese and a little salt and pepper. When I use potatoes I don’t mix them in with the eggs. Heat the oil in an oven proof skillet over medium heat on the stove. If using potatoes, I layer the sliced potatoes in the bottom of the pan and let cook for a minute or two. Then pour in the egg mixture. Do not stir or touch it. Cook for about 8 minutes untill the edges are firm. Then move the whole skillet to the oven and bake for 15 to 20 minutes. Untill eggs are cooked all the way through. I like to serve it with toast and fruit. Here’s this weeks garden shot. 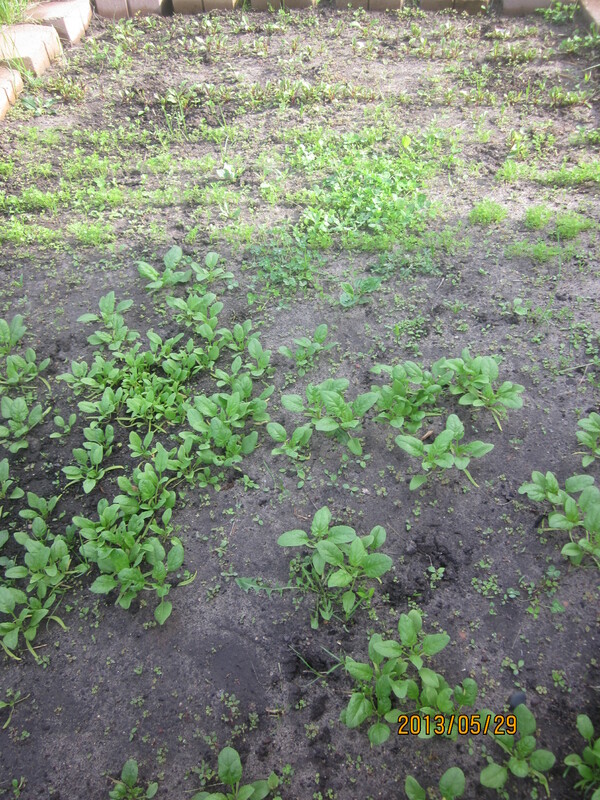 Again, there are a few rows of beets at the top, a few rows of carrots in the middle, and a patch of spinach at the bottom. It’s been another rainy week, so I have weeds again. Last year I read in an organic gardening magazine that weeding may be counter productive especially with clover, which puts nitrogen back into the soil like other legumes. So I leave my clover usually. I have always loved hands and feet! You may have wondered why I named my blog Li’l Footprints. Here’s why. Think about how much important work our hands and feet do all day. Much of this work is what makes us who we are. I think you can tell a lot about someone from looking at their hands and feet. On a more personal note, and perhaps what solidified my obsession with feet in particular was my little ones’ kicks when I was pregnant. I know, it’s not always their feet “kicking” you in the ribs and the badder, but I often imagined them to be. And what a special and life altering feeling those kicks are! Would you believe that when we had our 20 week ultrasound for our oldest, the first thing we saw was his foot? It’s true! Right from the bottom, like a little footprint on my uterus. A peaceful morning spent with my sister planting her vegetable garden. The nourishing rain that waited until all the seeds were sown before it began to fall. The smiles and excitement of both my sweet children when I walked in the door after being absent all day. What are the simple blessings in your life? We are dealing with a sleep breakdown in our home and My husband and I are about to lose our minds and our tempers. About 2 months ago our 3 year old son became fearful at night (and of his bedroom in general). And our 1 year old daughter (who has always had trouble sleeping) decided not to take her afternoon nap. It started with my son creeping into our bed in the middle of the night most nights. At first we thought little of it. We figured he had come down to use the bathroom and decided our bed looked cozy. Then it became so routine that we stopped even noticing he was there. My husband and I decided that this had to end because we were losing sleep and often our daughter wakes up early, and she was waking our son up too. Basically, no one was getting quality sleep this way. So we sat our son down during the day, and asked him what was going on. Why was he waking up and coming to our bed? “My Scared.” was his answer. So we asked, “what are you scared of?” His answer was his toys, and each night he was scared of a different toy in his room as we tucked him in and began to walk out of the room. And so it began: the nightly routine of moving toys out of his view, removing toys to other rooms in the house, and most recently covering offending toys with blankets. 2 nights ago my husband even moved my son’s reading chair into the closet. All of these tactics help to get him to fall asleep peacefully, but he still wakes up most nights yelling for one of us. His voice screaming, jolts me awake at night, and I sleepily make my way up to his room. Next thing I know I am again trying to reason with him about his toys, covering toys with blankets and losing my cool. This goes on for an hour or 2 and I often can’t get myself back to sleep when it’s over. I usually fall asleep just before my daughter wakes for her crack of dawn nursing (which I have given up on breaking her of). I know this is a 3 year old thing and it will fade, but I’m getting to the end of my rope, which is made thinner by my daughter who stopped taking her afternoon nap. She still gets fussy and rubs her eyes around 2:30 pm, but when I lay her down and leave the room she’s quiet for 10 to 15 minutes and then begins to cry and cry. When I finally rescue her she is fussy and tired until she goes to bed for the night. It doesn’t help that she seems to be a light sleeper and wakes up everytime my son uses the bathroom which is located next to her room. I’m at the end of my rope! So our solution? Switching our kids bedrooms. I have no idea if this will be the answer to our prayers, but I’m holding on to hope. My thinking is that moving my son downstairs closer to us will help calm his fears (and save me climbing up and down stairs 10 times in the middle of the night). I also hope that moving my light sleeping daughter upstairs and away from the daily hustle and bustle of the more active parts of our house will help her fall asleep and stay asleep during the day. Anyone have any ideas that worked for them with frightened 3 year olds? The vinegar helps cut grease and kills germs. It also makes things nice and shiny! I find that the essential oil really cuts the vinegar smell and smells fresh and clean. I sprinkle borax in the tub and use a brush to scrub the whole tub and shower surround. I then rinse. I finish by spraying the whole tub and shower down with multipurpose spray (recipe above), wiping with a cloth, and rinsing again. The tub sparkles and stays clean through a week of baths and showers for my family of 4. I sprinkle the borax 1st. Then pour in the vinegar. I do this before I start cleaning the rest of the bathroom and wait untill last to scrub the toilet and flush. I spray the tank and seat down with multipurpose spray and wipe with a wet cloth. I wash the sink and counter just like the bathtub, and I wash the tile floor with a mixture of borax (about 1/8 c.) and hot water (about a gallon).